The Miracle Machine manages to be miraculous and completely ridiculous at exactly the same time. 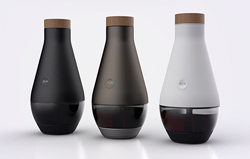 It’s a wine-loving megalomaniac’s dream, simply add ingredients and water into the device, download the MM app, connect it up to your phone via Bluetooth and then a sudden puff of magical smoke (and a few days) later you’ll have turned water into wine. On The Miracle Machine website the team state that they’re keeping the tech behind the gadget secret, but hint that the magic is all thanks to “an array of electrical sensors, transducers, heaters and pumps”. At around $500 for everything you need, the wine-making device certainly isn’t cheap and we also wouldn’t want to bet the stuff you end up creating is particularly tasty. But for those with money to burn, a weird desire for omnipotence and a thing for super-connected appliances, The Miracle Machine might be worth showing off at your next dinner party. The Miracle Machine will be seeking funding on Kickstarter soon. UPDATE: According to Mashable, it was all just a big hoax to get people to pay more attention to a not-for-profit organisation called Wine to Water. The original story was picked up by more than 600 media outlets around the world because it’s actually not that much of a crazy hoax – you CAN make wine at home, it just would usually take more than a few days.